in New Mexico, Santa Fe, U.S.A.
With its dramatic scenery, Santa Fe appeals to travelers seeking bold beauty. Art appreciators are attracted to this section of Northern New Mexico like bees to honey, thanks to a wealth of world-class museums and hundreds of galleries. 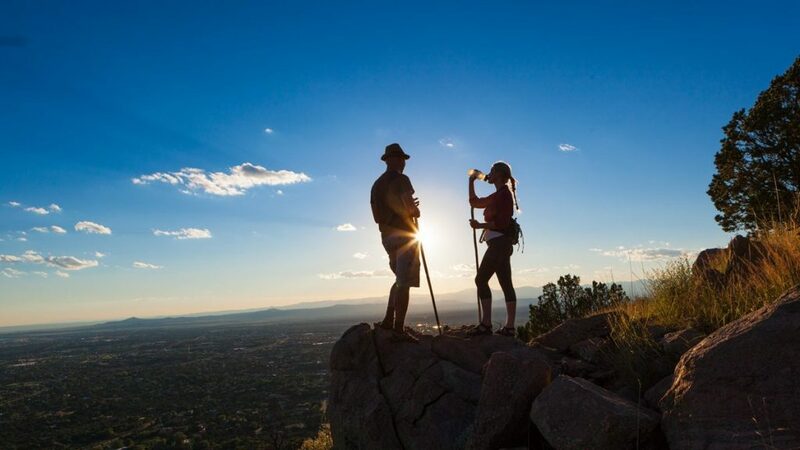 For the outdoor adventurer, Santa Fe presents the ultimate getaway. 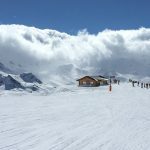 You can cycle and ski all morning before you hit the cultural circuit in the afternoon. With its titillating culinary scene, you’ll fill up on some of the best food and drink in the American West. Santa Fe sits at an altitude of 7,200 feet above sea level. 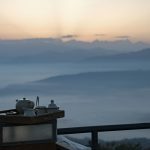 The thin air can have a strong effect, so take some time to acclimate before you dive in. Nestled in the Santa Fe National Forest just 16 miles from town is Ski Santa Fe. 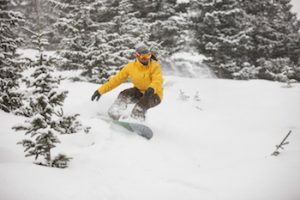 With 83 trails and snowmaking covering over 50% of the mountain, there’s fluffy white stuff and diverse terrain to suit every skier and boarder. Catch the RTD Mountain Trail Bus for $5 (exact change required). When you exit the bus you’re given a token good for $5 off lift tickets and other purchases. Soak in the vistas as you practice your downward-facing dog en plein air when you book a class with Yogihiker. The traditional hike/yoga combo takes participants through the Santa Fe National Forest to a scenic spot. After a one-hour long practice with an experienced teacher, you’ll hike back down, feeling relaxed and grounded. The Santa Fe Rail Trail is easy to access from the Santa Fe Depot. It’s a fairly flat ride to the town of Lamy, with a few nice dips. The first 10 miles or so are paved. Scenery is spectacular throughout, with views of the Sangre di Cristo, Jemez and Sandia Mountains. Rent your wheels at The Broken Spoke or join a guided cycling tour with Santa Fe Mountain Adventures. How about a rafting trip down the Rio Grande? The seasoned guides at Santa Fe Rafting will help you get wet safely with all necessary equipment, including helmets. They offer longer trips that wind down the Rio Chama. Santa Fe’s food scene is recognized as one of the country’s best. Its beverage scene is also worthy of accolades. Santa Fe Spirits is producing some of the finest liquids out there. Book a distillery tour or head to their downtown tasting room and see for yourself. Founded in 2010 by Colin Keegan, local and organic ingredients are used to produce a potent range of spirits including whisky, vodka, gin and apple brandy, made with apples from Keegan’s own orchard. Atapino is their latest small-batch treat. To make it, they roast pinon nuts and place them into a new oak barrel to soak in single malt white whisky for a couple of months. It is lightly laced with hand-collect ponderosa pine resin for a pinch of welcome sweetness on the palate. This spirit oozes terroir and shouldn’t be missed. Santa Fe is said to be the first place in the world where tequila was exported from Mexico. While they didn’t invent the margarita, the Margarita Trail celebrates its connection to this 100% agave treat. A passport lets you collect stamps from bartenders along the self-guided, booze-infused trail. You’ll receive a dollar off each of the dozens of specialty drinks. Prizes, including a commemorative t-shirt if you get 5 stamps, are an incentive. 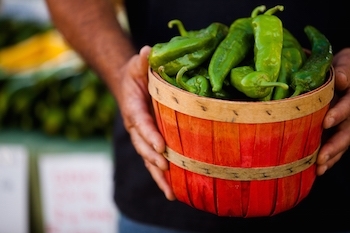 Don’t leave town without tasting Santa Fe’s famed and sometimes fiery red and green chiles. Make like a local at Cowgirl BBQ and order a chile cheeseburger. It’s a bold, full of flavor treat. Live music, impromptu dancing and friendly service make this place a winner. La Posada de Santa Fe, a Tribute Portfolio Resort & Spa, is an in-town oasis. The six landscaped acres include a pampering spa, saltwater pool and delectable dining options. 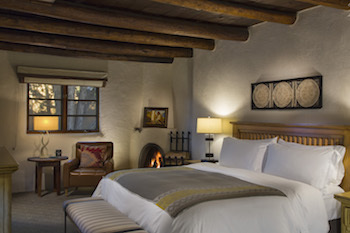 Guests stay in adobe-style casitas with Southwestern accents, some with beehive fireplaces and private patios. The staff goes above and beyond the call of duty with gracious service. The collection of art, all of it for sale at the artist’s studio price, adds mucho visual appeal. The hotel’s award-winning bar draws a loyal crowd. Order the apricot-laced Juliarita, named for Julia Staab, the wife of the original owner, who some claim still haunts the premises. It’s on the Margarita Trail, so don’t forget to get your passport stamped. Santa Fe is known for its museums including the Georgia O’Keeffe Museum and the New Mexico Museum of Art. Hundreds of galleries make it an essential vacation for any art lover. Meow Wolf is like nothing else you’ve ever seen. Located in a former bowling alley, this visionary installation is filled with interactive, multimedia exhibits. 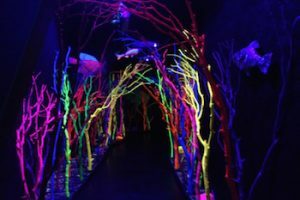 Meow Wolf is rooted in individual perception and is constantly evolving, so each visitor will have a different experience and no two visits will be exactly the same. 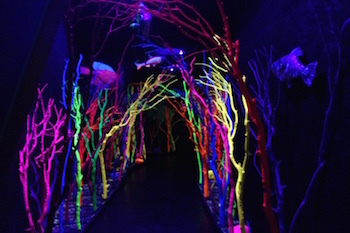 It’s part museum, part psychedelic haunted house, and all spectacular fantasy. 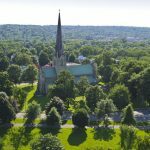 It’s easy to traverse this compact city by foot. The free Santa Fe Pick-Up shuttle cruises by many points of interest. The Santa Fe Trails bus system is efficient and comprehensive. Most visitors fly into Albuquerque. The Sandia Shuttle is a one-hour ride to Santa Fe. Photo credits: Tourism Santa Fe, La Posada de Santa Fe, and the author.